Reflections about life, Scripture, culture, and the mission of God. I hope to always keep the mentality of a growing minister; like a perpetual Timothy (I Timothy 4:11-16). I have thoroughly enjoyed blogging here for many years, and I intend to leave my old posts in place, should I want to revisit them. When I started blogging, it was the pre-Facebook days, and the content here has been rather scattered in theme and purpose and was often more of an online journal than anything. A few months ago I decided to create a new website called Kingdom Upgrowth. It will be much more focused on Christian life, leadership, and flourishing. I really hope you'll check it out. The blog here began as Perpetual Timothy. I eventually reduced that to a sub-heading (especially since I'm not as young as I was when I started blogging). I like being able to look back at different years of my life and see what I was thinking about. Quite a few posts I have removed, wishing I had been a little smarter or more tactful. It's been a great ride. I hope you'll check out the new spot. If you are reading this, it probably means you were a subscriber at my blog here. Would you do me a huge favor and consider subscribing to my new one? I would love to stay in touch with you. I've never met a self-assessment test I didn't like. Actually that's not true. Some of them are much better than others, but I am nearly always up for trying a new one. I want to describe in some detail three types of assessment that have caught my interest for the last few months. For years now, I have asserted that the Myers-Briggs Type Indicator (MBTI) are one of the most useful tools I've encountered for understanding people. In case you're wondering, I am an INTJ. The MBTI, in my opinion, has been highly useful in describing people's general tendencies and way of being. When I first discovered the test and read my profile, I immediately said, "Wow, it's like they've been watching my every move!" It is helpful, in my opinion, for an employer to have people post their MBTI letters on the entrance to their office so that when you want to maximize your effectiveness in working with another person, you will know what kinds of information they would want, and how they would want to receive it. I, for example, have zero need for small talk, and feel a person "gets" me when they visit me and jump right into what they want to talk about. Others feel that all "business" with little small talk is cold and impersonal. Neither of us is right or wrong; it's a matter of our personal preferences. Knowing how a person focuses their attention, how they receive information, how they decide things, and how they like to approach the world can give you great insights into working with them. The down side of the MBTI is that it is descriptive but not prescriptive. I find it less useful for personal growth. I was an INTJ in my 20s and I'll likely still be one in my 40s. It's simply how I am. While this information can help another person to interact with me, it provides me with few insights on how I can grow. Recently, I have continued exploring other well-established tools for assessing individuals and groups. I would readily tip my hat to the Grip-Birkman Assessment. It provides insights into what motivates you, the ways in which you generally function, and also helpful warnings about your stress behaviors that creep in when you are not keeping yourself healthy in terms of what you deeply need. I was part of a group that received this assessment, and got to do some exercises with each other in imagining ideal ways of working together. It was good. I found the Grip-Birkman interesting, but I have found deeper insights in the Enneagram for how I can grow as a person. I have been hearing some of my peers talk obsessively about the Enneagram for a few years. Other than taking a couple of free online assessments to see what my number is (1-9) My first real venture into the method was in the Cron & Stabile book The Road Back To You. What the Enneagram does better than a Myers-Briggs assessment is that in addition to describing how you are and what motivates you, it provides a path for personal growth. Let me try to describe briefly how the Enneagram functions. There are nine numbers. 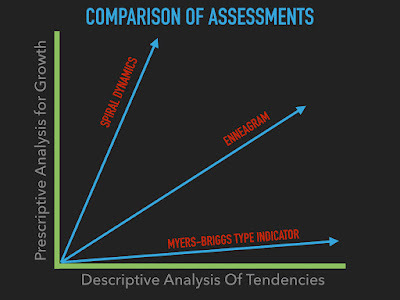 Much of the analysis of the Enneagram comes from exploring how some numbers connect to other numbers. 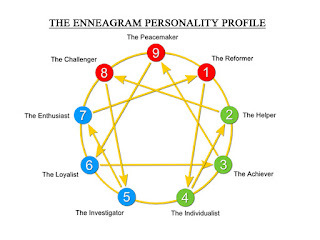 For example, each Enneagram number has two "wings"; a number on each side of it. You could be a 1 with some notable 2 leanings, for example. There are also a variety of other triads and groupings people use to show connections between the numbers, such as the head (5, 6, 7), heart (2, 3, 4), and gut (1, 8, 9) triads. 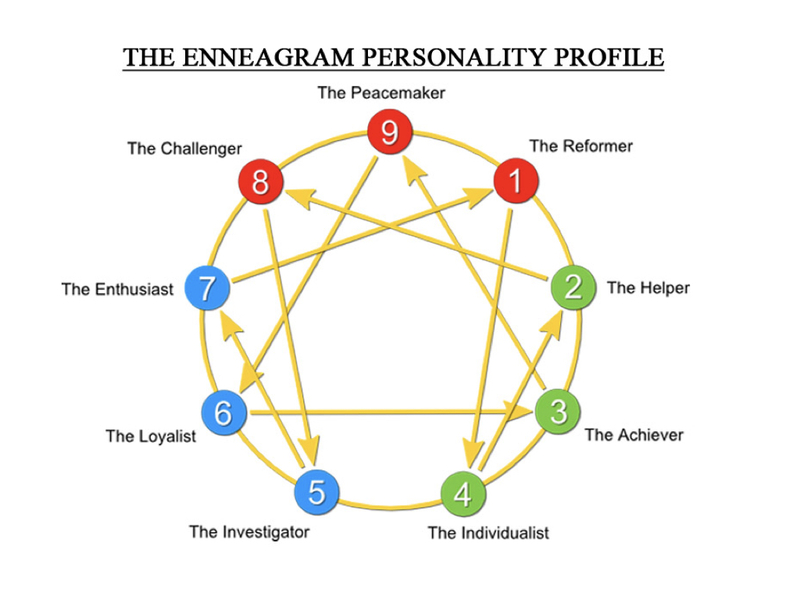 I find the Enneagram appealing in part because there are a lot of historical connections made between Enneagram numbers and spirituality. There is for each type a particular kind of sin or negative tendency that can often be a struggle. Here are the 9 number identities and associated negative tendencies. There are arrows used in some models of the Enneagram. The arrow pointing away from your number shows how under stress, you may take on negative characteristics of another number. The arrow pointing toward your type shows how when you are healthy, you may take on positive characteristics of another number. I am a Five. I absolutely love learning and information and I never stop being hungry for more. In general, this can make me resourceful person to those who want to learn from me. The things I know, I generally know well. As my emotions are generally in check, I can make a good counselor/helper for someone who needs an objective ear to listen. When I am in a mode of high stress, I can take on the negative tendencies of a Seven, which would be that I shut down and start avoiding anything that's uncomfortable for me. Interestingly, when I'm healthy, I can take on the positive characteristics of an Eight, who are typically blunt and boisterous--quite a jump! It is not uncommon for Fives like me to be perceived as very quiet or serious until we get comfortable enough to joke and laugh with people. I have had many people in my life experience this transition for me and say, "Where did you come from? I didn't know you had this side!" Something profoundly helpful to me that I learned from Cron and Stabile's book is that my never-ending quest for knowledge, if I'm not careful, is actually driven by fear. I don't want the world to be able to hurt me, and the way I attempt to protect myself is to accumulate knowledge and skills obsessively. It is common for Fives to be high achievers in education (Dr. Adams here, guilty as charged). A danger for me is that I could be so busy trying to shield myself against what the world might hand me that I fail to engage the actual world at all. Fives like me need fun, spontaneous people to help us learn to take a break and have more fun. I knew how much I loved learning and fine-tuning skill sets, but it was a real "Ah-ha!" moment for me to confront myself that part of why I do this is out of a mindset of scarcity ("I must protect myself") rather than faith ("God will take care of me"). Another mode of assessment I am just beginning to learn about is called Spiral Dynamics, based on the foundational work of Clare Graves, whose untimely death likely prevented his work from gaining as much prominence as it would have otherwise. Spiral Dynamics are more effective for analyzing groups of people than some other assessments. Whereas the MBTI leans toward describing people as they are with great specificity, Spiral Dynamics place little emphasis on individual personalities, but are entirely focussed on levels of growth and function. 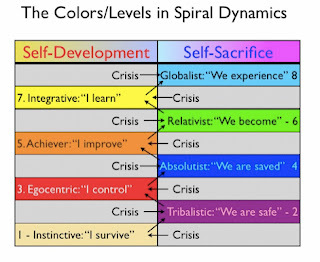 The first reading I've done related to this theory was in a book called Tribal Leadership, which is applied methods approach that only loosely references Spiral Dynamics. Generally, people start off as low-functioning survivalists. The idea is that as we grow, we move from survivalism, to individualist achievement-seeking, to group appreciation, to a higher value system that moves towards what is good without a need to feel competitive or antagonistically tribal. Spiral Dynamics uses colors to describe the differing levels of human functioning. Interestingly, there is a back-and-forth movement in how people develop between times of self-examination and learning and times of group valuing. Some of the higher levels exist only in imaginative conception, and seldom if ever in reality. Of all the assessments, Spiral Dynamics is the one of which I presently have the smallest amount of understanding. As a minister, I have found myself increasingly interested both in how to grow as a person and in how to help others to do the same. This necessarily involves some accurate assessment of how people are and imaginative descriptions of what people can become. I have tried to chart out here what I see as general leanings of these three tools for assessment that have caught my interest. I intend to do quite a bit more reading on the Enneagram especially for now, hoping that it might be a tool I could use in a class or group setting to help people learn more about themselves and set goals for growth. I have done a fair amount of research into the process of receiving certification in these tools, and may seek this out in the future as well, depending on my perception of their usefulness for helping others. 1. Positive Psychology - How do we go beyond fixing problems to promoting genuine human flourishing? Do you have experience with any of these? What other assessments have been helpful to you? Everyone has plenty of opinions on what it means to raise up a child in the way that he or she should go. But when there is quantifiable research to back up certain methods, we are wise to pay attention. LifeWay Research recently conducted a study with the parents of 3,472 adult children who had been raised to be Christian by their parents. There were eight observable points assigned to try and measure the spiritual health of the adult children: (1) They identify as “Christian”, (2) they share their faith with unbelievers, (3) they actively attend a church, (4) they read the Bible regularly, (5) they have a serving role in a church, (6) they teach others at church, (7) they serve in the community, (8) they support local or foreign missions. The research was looking to see of those grown children who scored the highest, what were the factors that contributed to them becoming dedicated Christian adults? Of the 3,472 adult children studied, 85% of them were at least 1-point on the scale, meaning they at least identified as Christian. A full 39% of those surveyed fit this category, but also said they did nothing else besides wear the name “Christian.” Another 11% did not identify as Christian. But what about those who scored higher? What factors drive young people to stay in the faith, and even more, to actually practice their faith as adults? Those conducting the research noted that if a child had all five of these practices in their youth, this made them 41% more likely to become active Christian adults. What is interesting to me about this research is that the findings seem so obvious. We need to be deliberate about our choices and actions, because our children observe and repeat them. Are we actually reading the Word and listen to things that inspire us? Do we actually make time to pray? Do we generously support the church? Do we serve in God’s mission locally and abroad? When parents model this behavior and then encourage it in the lives of your children, the research shows again and again, it pays off. Don’t neglect the fundamentals! To learn more about this research, you can find the study here. Colossians has some of the loftiest language in Scripture used to talk about Christ as the "image of the invisible God." Paul speaks of the importance of understanding who Jesus really is, leaving behind what keeps us from God, and putting on the traits of Christ. It's clear that a lot of important things are happening. The end of the letter contains a list of personal greetings and comments. There's Mark, the cousin of Barnabas, and Luke, the physician. Paul concludes by wishing them all grace, but before he does, he also says, "Remember my chains." Those three words, remember my chains, take us into the reality of the present. Jesus is Lord, he is the firstborn over all creation, and all his enemies will one day acknowledge his lordship, but right now, please remember me and what I'm going through. I need your help. This passage makes me think about how important it is for each of us to strive for deeper friendships among fellow believers. It isn't possible to know everyone, but it's critical to get to know some people well enough that you can share in each other's challenges. It's so easy to settle for a quick handshake and a surface level conversation about the weather. But I wonder, as we pass by each other on our way here or our way home, what are the burdens that people are carrying quietly? Many of us are too shy or humble to want to draw attention to our problems, but just the same, it helps to know that someone remembers your chains. "How have you really been?" "I remember you told me about ____, have things gotten any better?" "Catch me up on how things have been going for you." Even the apostle Paul needed to feel personally valued, no matter how strong he was in the faith. He didn't need them to fix it or solve it; just to support him as he endured it. And surely this is part of why God has given us the church, so that we don't ever have to face any struggle alone. Are you investing yourself in others enough to know what their struggles are? Are you giving them the opportunity to do the same with you and yours? There's probably someone near you right now who would feel a little better if they knew you were remembering them and their struggles. Colossians 3:12-15 contains a beautiful portrait of what a Christian life should be. There are several aspects of our character that should serve as ornamentation for who we are: compassion, kindness, humility, gentleness, patience, forgiveness, and--most of all--love. The one thing that all of these share in common is that they require conscious decisions. It takes effort to be compassionate, kind, humble, gentle, etc. Paul uses these to describe someone who has clothed themselves with Christian character. Being dressed and prepared requires that action of dressing and preparing. In contrast, the life unclothed requires no such preparation. We could make a similar list for what describes a person who has not put on Christian character: uncompassionate, unkind, arrogant, gruff, impatient, unforgiving, and--most of all--apathetic. These things require no skill and no forethought. If we are to overcome these, we are to let "the peace of Christ rule in your hearts...and be thankful (Col. 3:15)." That little phrase at the end says a lot. It is one thing to curb our behaviors. We can become less reactive and more prudent in what we say and do. But we are invited to change at the heart level. In every situation, be thankful. When people show you kindness and acceptance, be thankful. When you get the promotion, get the contract, and achieve the win, be thankful. But when you feel challenged, opposed, and defeated, continue to show the character of one who has wrapped yourself in Christian character. Let Christ's peace, and not your gut reaction, be what rules in your heart. Trust that God's strength will become even clearer because of your time of weakness. And be thankful. A thankful heart on the inside begins the transformation of who you are on the outside. For the last few weeks, I have written my bulletin articles as reflections on Micah 6:8. These are not deep exegetical efforts, but more devotional in nature. They are here for you to peruse if you would like. He has told you, O man, what is good—and what does the Lord require of you,but to do justice and to love kindnessand to walk humbly with your God. Think about the first line. “He has told you, O man, what is good.” Though there are many things that divide people and cultures, there are also certain things that we all share. One of these is the seemingly endless quest for what is good and worthy of our time. Even in the Declaration of Independence, the “pursuit of happiness” is counted as an inalienable right, given to all human beings by our Creator, and which therefore no government should take away. Yet here in Micah’s words, we are reminded that for all the billions of dollars spent each year on vehicles, homes, vacations, sports, education, dramatic arts, music, and on whatever else it is we turn to seeking happiness, God has already told us what is good. This should provide an immediate advantage to the children of God, because our lives should not be characterized by needless pursuits of frivolous things. True happiness comes from being at peace with the one who created us, and from showing love to his children. It is in fact possible to live a beautiful and meaningful life without ever traveling even a mile from the place you were born. God’s Word has come to us as a gift to be received, and here in our lives, God provides us with everything we need to flourish, right where we are. This isn’t to say we shouldn’t go out and explore this big beautiful world and meet the amazing people with whom we share it. We just need to understand that what can bring us truest happiness is all around us and within us, begging for our notice and cultivation. Seek first the Kingdom of God to find your joy there, and God will give many other good things to you as well. The only way we can receive the grace of God is as a gift. It is unmerited kindness, which we could never fully repay. There is no measurement or criteria by which we could excuse ourselves from our shortcomings and limitations. We must all turn to Christ if we want to receive salvation, and allow the Spirit to strengthen our walk, making up for what we lack. Yet because we have received grace, our gratitude for this gift should become obvious in our conduct and character. Micah reminds us that being saved does not come without expectations. In our weekly rhythm of worship and work, it is important to keep asking that question: “Here, where God has placed me, what does God expect from me?” Perhaps God has kept you where you are for reasons unique to yourself. Maybe you could offer a word of encouragement and be heard where others would be ignored. Maybe it is your talents that God intends to use for something larger if you were to make yourself available. It isn’t a sense of guilt, or an attempt to pay off our salvation debt that drives us, but instead our gratitude, and the privilege of getting to use what we’ve been given as part of the work that God is accomplishing in the world. This might make a worthy thought for you this week as you remember Christ in communion. “What does the Lord require of me? How could I honor my Lord more this week than I did last week?" There is more to this thought, but let’s not rush ahead to it. Justice and kindness both cast long shadows of importance over Scripture. God seems to have a special place in his heart for widows, for orphans, and for foreign immigrants; all of who are vulnerable or out of place. If we want to have a heart like God’s, we would do well to cultivate love in our hearts for these same groups of people, and for others who are at a disadvantage. Could you even begin to describe the value that your immediate family members have had in shaping your life, for better or for worse? If you had a father or a mother who made time for you, who played with you, who talked with you about God and how the world works, can you even imagine where you’d be without the influence they have provided you? Have you ever had to make a move to a place where you knew no one and to be called the “new kid” or the “foreigner.” If you’ve not had the experience of losing a parent or a spouse, or being completely uprooted from all that is familiar to you, count your blessings. Many cannot say the same. We cannot always know a person’s backstory when we meet them, but it seems that we should always keep our thermostat set on kindness. If you were new, if you were vulnerable, if you had lost the person closest to you in your life, what would you want others to do for you? That’s a significant part of Micah’s phrasing, isn’t it? We’re called on to love kindness, but justice is something we are told to do. We cannot always ensure an equality of outcomes for people, but we can do everything within our power to give people a fair chance and better possibilities. There are people in your life right now who would give anything to be in your shoes. What could you be doing to help create that possibility for them, especially if they have no other good role models to guide them? This thought is a continuation of the last thought’s admonishment. We are to do justice, we are to love kindness, but we are also to walk humbly. Humility is slippery, isn’t it? As soon as you claim to have achieved it, you’ve lost it. At this point in my life, my favorite metaphor for Christian leadership is the idea of creating space. I believe it ties in easily to humility. A good question for servant leaders is, “How do I create spaces where others can use their talents in a way that glorifies God, where they can be encouraged and strengthened, and where none of the attention is focussed on me?" A person who is confused or hurting needs a leader who makes space for them to share what’s on their heart. Even a simple hug is a way of making space within myself so that there is a place for you with me. John the Baptist had it right: “He must increase, but I must decrease. (John 3:30)"
Consider the significance of space. If you build a new home, the real value of a home is not in the foundation or the structure, but in the empty space contained therein where a family’s life can happen. The value of a bowl or a container is the kind of space contained therein where you place the things you desire to fill it. Much the same with a stage in an auditorium, it is the space it creates for communication and hearing that makes it useful. “Walk humbly,” Micah reminds us. What people need from us is not for us to be the container that is overflowing with our own ego, with our own stories of self-importance, or with our own agenda. Walking humbly means that I value you enough to give you space in my life while also resisting the urge to crowd it. It is amazing how much people can grow when they have the space to. Can you walk humbly enough to be the empty home where others can find refuge, the empty bowl that would receive and value what is special about them, or the open stage that celebrates them and allows them to cultivate their own God-given gifts? Humility is a tricky concept, but it certainly has to involve more of God and less of me. In this final reflection on Micah 6:8, having been admonished to do justice, and to love kindness, and to walk humbly, Micah reminds us that we are to do all of these things “with your God.” God hasn’t just handed us an instruction book and left us on our own to figure it out; he goes with us. Something about the specificity of that prayer is helpful to me in remembering that whatever it is we are doing, wherever it is we are going, there are opportunities to experience God and ways we can honor God. This was as true of Paul’s sermons in the most impressive hearings as it was of his quiet conversations behind bars. Likewise, it's just as true of your morning commute, your afternoon cup of coffee, and your evening routine with your family. God’s presence is unchanging. It is our awareness that needs changing. In Scripture, “walking” is often used as a way to speak of a person’s life. Your life is your journey, and in Bible times, there was no way to journey that didn’t involve walking. You don’t have to walk alone, and you don’t have to travel to an exotic location to find God. You’ll discover he’s been there all along if you’re willing to include him. Do all of the things you’re doing, but do them with your God. This is a picture from 1912 where some poor man is testing a rugby helmet. You can theorize all you want about the best places to put padding, straps, and protection. You can use dummies and simulations. But in the end, when you put on a helmet, the only true test that matters is when you have a collision that requires you to depend on it for your safety and survival. I think faith works in a similar way. I'm not opposed to hearing a variety of ideas about God, the universe, and humanity's place in all of it. As you know, there are numerous competing ideas in the world about where we came from, what is morally good, and what is a worthy use of our time. But the only way to really know how much you can depend on the object of your faith is when your faith has been tested by some collision with reality. It is not the amount of faith we have that makes us safe and secure, but rather the one in whom we put our faith. It doesn't matter whether you have a beautiful, shiny helmet of a trendy brand or an ugly, colorless helmet with no label. What matters is how well your helmet actually protects you when you need it. Many people are absolutely convinced that what is trendy must surely be what is best, and they will race ahead without ever giving thought to what might happen when in their life they hit a wall. 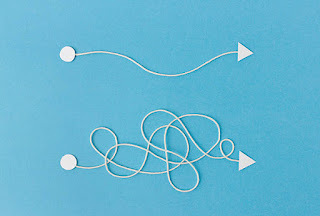 Though we would never actively seek difficulties, James says that as Christians, we should be encouraged when we face difficulties, because the outcome of our tested faith is that we'll learn that God is solid and reliable, and because he's been reliable one time, we know we can trust him even more the next time (James 1:2-4). The good thing about collisions is that they get past the exterior appearances and force us to grapple with whether or not we are building our life on something solid. 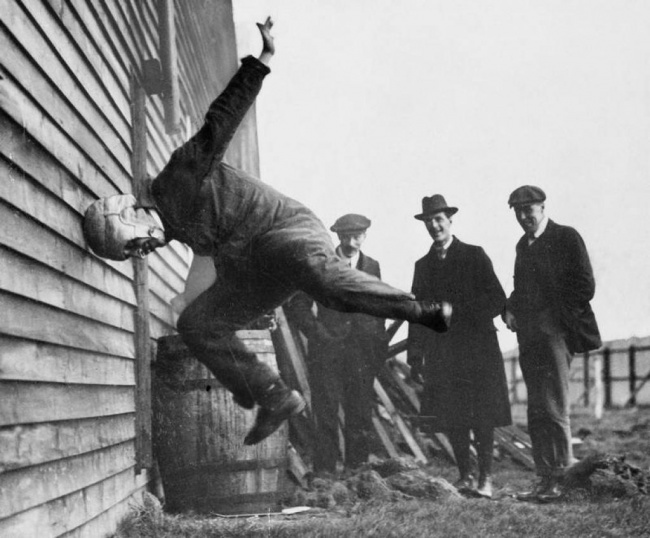 Perhaps we are also wise to notice the three men in the back of this photo, conveniently not beating their heads against the wall, but witnessing the other man's collision. If you want to know the strength of a belief system, watch closely those who have held on to it through difficult situations. Think of all the cancer survivors we have at church. Think of those who had formerly been incarcerated or who have recovered from addictions. Think of all those who have lost spouses and even children, yet continue to worship among us each week. You may not have experienced the toughest challenges of your life yet, but you can learn a lot from those who have. Was the help that God provides enough to carry them through? Your collisions will come, sooner or later. Be thoughtful about how you are preparing yourself, and be sure you're putting your hope in something--or someone--on whom you can depend. Having just returned last week from the mission trip to Costa Rica, I was reminded of what a refreshing thing it is to experience simplicity. There is nothing like waking up each morning with only one clear objective and one priority, which is to glorify God and to serve him wherever we are. On a mission trip, this is made even easier, because we have pre-arranged for things like meals so that all we're really having to concern ourselves with is the work for which we've prepared. There are no competing schedules or priorities. Beyond this, I can't express how much I enjoyed not watching the news for a solid week. I never had to hear the words, "Trump", "Russia", "Fake News", or anything else like that and I didn't miss it a bit. I got on social media once each day to post an update with pictures, but very little other than that. Once again, I didn't miss it a bit. It's not possible always to be so undistracted in our normal settings. There are work and family schedules and obligations, and current events which affect us. 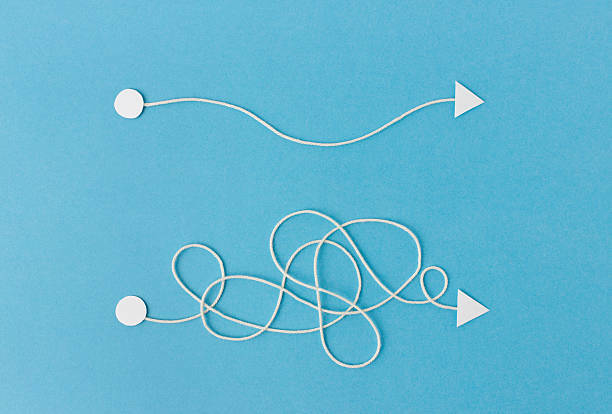 Even though we cannot achieve perfect balance in our lives, we will still benefit from the effort to live in a way that is more simplified and focused. I wanted to share a list with you I came across a few years ago by Richard Foster. Foster has written some enormously helpful books on practicing spiritual disciplines, and these are his guidelines for simplicity. They are worth considering. 6. Develop a deeper appreciation for the creation. 7. Look with a healthy skepticism at all "buy now, pay later" schemes. 8. Obey Jesus' instructions about plain, honest speech. Have a great week...and keep it simple! We had a busy day yesterday and I didn't get a chance to post. There is quite a bit of routine to what is going on during the weekdays this week. VBS in the morning, prep work in the afternoon, and evangelistic worship gatherings in the evening. VBS is running really well. One of the things I enjoy doing on mission trips is pushing people out of their comfort zones, and it is often the Christians from Costa Rica who have to stretch themselves. They have all the same timidness that we do about speaking, being in front of people, acting, leading singing, etc. I have continued saying to two or three of them at VBS, "Hey! I'll lead two English songs and then you lead two Spanish songs." Day 1 and 2 they looked at me like a deer in the headlights, but yesterday afternoon a bunch of them got together with a big group from our team and they were all practicing and teaching each other songs. This morning, I had told them that I wasn't going to help with the song leading because I knew they could handle it. And they did great. Hunter had gone on the trip before, and she took a lead role in getting the kids warmed up. The skits have all been great, and the children are loving all the booths. Carolina brought a bluetooth photo printer with her, a tripod, and some props for a photo booth. The little pictures we've been making of the children have been a huge hit. Stacy and his merry men + Chelsea continue to do amazing work on the stage. Now they are ready to put down carpet, to stain it, and to do the trim work. The ramp on the right side turned out well. During our break time today we took the group to an art marketplace downtown. Part of me loves going, but part of me gets irritated when some of the vendors try to rip me off. Even so, we all bought some nifty souvenirs and a few things I'm sure we will auction off later to raise money for future trips. We've started coming a little earlier in the evenings before dinner back to the church building so we can sing together. It's been enjoyable. Tonight before dinner, we got all the ladies who have been cooking for us and sang to them "The Lord Bless You And Keep You." They were visibly touched. Tonight was just fantastic. I had the privilege of speaking, and it was one of those occasions where I really liked the text I was preaching from (the Prodigal Son), and could just feel it was a significant event. I talked about the father and the two sons, and how both sons had been deceived by Satan in different ways, urging people to return home if they needed, and to welcome home those who have been far away. At the end of the sermon, a man came forward named Josue David. We took him to a back room to visit with him, and he was absolutely broken. He started gushing all kinds of things about his life and his deep desire to have hope and to be a better person and a better father. We were able to baptize him, and it was a very significant moment for everyone present. Very few dry eyes in the building. Here's something I think is really cool: Some of our people met him while they were out door-knocking and passing out flyers about the VBS and evening Campaign. He talked to them, and they studied the Bible with him a little bit. Today he brought his boy to VBS and Carolina had the chance to talk to him and to give him the picture we printed of his son on a cute VBS-themed foam backing. He showed up tonight, was convicted in his heart by the message, and made a decision that he wanted to be a Christian. He said to us before we left tonight, "Next time when you return, you'll find me here." We told him that was our hope and our prayer. Josue David was not someone they had been studying with before, and they had not even known him until the last day or so. They were only out distributing flyers because of the campaign, and they were having the campaign because our team made this trip. He came to the building for the first time because of the VBS, and in part because he was impressed with it, he showed up tonight. It feels really good to be able to say that because we made this trip, a person was saved tonight. We've had a great evening. Tomorrow is our last day of VBS and the last night of the evangelistic campaign. Today was part of what I love most about organizing mission trips. There are months--in this case, years--of preparation all leading up to the time and place where you go. You make charts, plans, and assign tasks to a variety of people. Everyone does their part, and when the whole thing comes together, it is so much more than just the sum of the individual parts. Our people had worked so hard creating backdrops and costumes for skits. Debbie had worked on scripts and had led rehearsals of the material. We tried learning some Spanish songs and decided who would do what in the various sections of the VBS rotation. But today, once we got it kicked off, it was so much fun to watch it all work. I knew it was great when I saw the kids start engaging the skit actors, laughing at our "sheep" and Kailani, our wolf (defeated by the shepherd). When our shepherd left his ninety-nine sheep to look for the one and started calling for it, all the Costa Rican children had seen it wander off and started shouting, "It's over there!" They loved the snacks, crafts, games, and reviews. I brought an enormous inflatable beach ball with us, which was a hit. In my wisdom and presence of mind, I invited our one asthmatic team member to be the one who blew it up. He did in fact, and it turned out great, but upon realizing what I had asked of him, I had a face palm kind of moment. I was talking to Ronald today and telling him I thought things were going well and I was very surprised to learn from him that this was the first time the church had ever tried a program resembling the one we put together. VBS programs are so common in the States, they can seem almost overdone. I had thought it strange when we were coordinating the trip with Ronald, I could tell he was having a hard time grasping what we had in mind with the VBS, but after today's conversation, it all made a lot more sense. I think this is one of the neat things about these kinds of trips, when our churches provide each other with fresh ideas and perspectives. Sometimes an idea that seems like old hat to one group might be something new and life-giving for another. The kids responded wonderfully, and I think the adults who are volunteering with us were really pleased with the program. Stacy Blair and his crew are doing an absolutely phenomenal job on the stage in the auditorium. In one day they did a full tear down of the old stage and had a functional stage in place for tonight. It's super solid. All they really have to do on it at this point is the finishing of the aesthetics, but the structure is done. We used it tonight! One of the things I love about Central Americans is that they waste nothing. Ronald knew about a family who could use the wood from the old stage, so their demolition was very gentle. They removed all the old nails and preserved all the boards to prepare to deliver it to the family who will use it. So now Jake is proudly displaying some Nashville Predators clothing. This is because he has incredible taste, and also because he has his clothing FINALLY. A couple of other things today I found touching. I learned that two of the ladies who are showing up and volunteering to cook all of our meals for us are riding buses to get here 1 hour 45 minutes each way. It was just really humbling to know they are going to so much trouble on our account. I was thanking one of the ladies who cooks tonight and she said, "We do it because in our hearts, we have great love for God and also great love for you." The other was our speaker for the Gospel meeting. Many people responded well to the speaker. He was eloquent and passionate. He spoke about the lost coin, and God's great passion for seeking us out because we have value to him. As he was speaking, he said something I didn't quite follow about how when he preaches, it's as if God gives him a "new tongue." What I learned after the fact is that the rest of the time, he always stutters, but when he preaches, he never stutters. It was an interesting thing to learn about him, and he credits God with the help. Tomorrow through Thursday will be the same basic routine with VBS and work projects in the morning and Gospel Meetings in the evenings. But along the way I'm sure we'll continue to meet new people and have pleasant surprises. The team has all showed up on time and been well unified in the things we've been doing. An unexpected blessing for us has been two girls named Shannon and Acacia. They are ACU students who are living at Ronald's house with his family while they are doing a language immersion school here in Costa Rica. They are very sweet and have jumped right in and helped wonderfully. I'm looking forward to getting to know them better this week, too. You can be praying about one of the ladies who responded to the sermon tonight. She is very interested in church, and is requesting some personal Bible study. Ronald is going to work out a time with her and has asked me to accompany him when he goes. I hope it comes together, and I'm looking forward to it.